We’d love your help. Let us know what’s wrong with this preview of The Bride Takes a Groom by Lisa Berne. To ask other readers questions about The Bride Takes a Groom, please sign up. I know, I know. 1 star. Guys, I never give 1 star to books. Buckle up. It's about to get bumpy. In this book, Katherine is in a terrible position. Her parents have an obscene amount of money, but money can't buy class, isn't that the saying? Her parents have given her the best education money can buy, but she was caught making out with a teacher, he of course blamed her, and her poor young teenage heart learned that lust is bad (more on this later). Her parents left he Review posted on Got Fiction? Her parents left her in that boarding school for a long time, so while they are terribly gauche and put on airs, she's very well-mannered. Her parents are trying to marry her off into the peerage so they can finally be accepted. Katherine has felt as if she's never had any control over her life at all, and she's been so smothered she's about to scream. Hugo is the eldest in a family of eccentrics, I guess. His family is a house full of ninnies. I have no other word for them. They are all immature and ridiculous. His mother was so silly. Just silly. Not a lick of sense amongst them. He's constantly being described as a Greek god, and that was so pointless. Seriously. Once was enough. He's back from the sea, he's in the Navy I believe, and he's decided based on a letter from his mother, that he's going to propose to Katherine. They were neighbors in their youth and he remembers liking her well enough, she has money, he has one of the oldest names in England, so win-win. You know there's a but here, right? Hugo is super laid back. He recognizes early on that Katherine seems to prize control, so he's okay with her taking over. However, she's just a horrible person. Once they get engaged, she goes to her parents, tells them she'll be getting married, then tells them her monetary demands and basically says peace out, folks. I'm leaving. It's an awkward scene for Hugo, but it shows that Katherine is just...immature and mean. This entire book felt as if everyone was much younger than they truly were. Now, her parents are supposed to be just horrible, terrible, awful human beings. I saw two very rich middle class parents who wanted the best for their daughter. And yes, they are incredibly gauche and vulgar, and they want to ride Katherine's coattails all the way to London. I get it. They were bad parents. But they weren't evil. They weren't that bad. There's a comeuppance scene for them at the end, and it felt so wrong. Like, they weren't that bad, so why write that scene in. It's supposed to be freeing to Katherine, but yet again, she just comes off spoiled and immature and makes rash decisions. This is a terrible romance. It's more a book about Katherine finding herself, and I sure don't like who she is. It took 200 pages for me to DNF, and really I skipped to the end anyway, but Hugo is a side character, a foot note, a cardboard cutout of a hero. He is bland, he has very little in the way of page time, and he by 200 pages in is thinking (even if only for a split second) of hooking up with another woman, and I can't say that I blame him. Katherine thinks she's acting polished and proper but really comes off constantly as stiff and priggish to everyone. At first, you don't blame her since her upbringing was absolutely horrid, but by 200 pages into a 300 page book, we should see some sort of change. At 2/3 of the way through this book, she should have at least an inkling of who she's becoming. But she's still horrible. And seriously, this far in, there should be a connection between the hero and heroine. This is a book about Katherine trying to figure out who she is now that she's achieved her goal of being free and in control. And Hugo is just along for the ride. Avoid this book. It's really tedious. The characters are silly and behave much younger than their ages. It's not what I've come to expect from Avon books. I'd also like to add that I decided to read the first book in this series immediately after to see if I'd have the same problems, and I did. This author is not for me, at all, in any shape way or form. I won't be reading her again. World’s coldest heiress meets world’s most likable hero – how in the world can this ever work? It can, and it is lovely to see. This is a well written and well-plotted book with a lovable hero and a heroine you will love to hate – at least for a fair amount of the book. Hugo Penhallow is a much-loved member of the prestigious Penhallow family. He’s not a peer, but his family name is so revered that he might as well be a duke. Hugo’s immediate family - mother, sister and three brothers - are impoverished. His father had spent his life on research rather than providing for his family and now things were getting really bad. Hugo, an army captain, was injured in the America’s (Canada) and had to leave the service. He had been sending a portion of his income to his mother and his cousin Gabriel had also granted Hugo's mother a stipend. Hugo thought that was enough to get by until he got home and saw the state of affairs. Hugo loved his family beyond reason. They were just a loving, caring, involved family – all of them – and Hugo couldn’t stand to see them impoverished. It was his responsibility to care for them. Before he’d arrived, he’d already decided to look up Katherine Brooke (a very wealthy heiress) who he remembered fondly from his childhood and ask for her hand in marriage. It would be a marriage of convenience only because he had never fallen in love and just assumed that he never would. Katherine Brooke hardly remembers her childhood before her father inherited all of her grandfather’s wealth. She had closed all of that away. She had been a sweet, loving child who very much enjoyed her closest neighbors – the Penhallow family – especially Hugo. She was bereft when he went away to school and then into the army. Then, her grasping, greedy, social-climbing parents inherited all of her grandfather’s wealth - they moved into a newly built garish mansion and Katherine became a pawn. Katherine was constantly belittled by her parents, nothing she ever did was good enough – she had to be absolutely perfect in everything and perfect was defined by her parents. Then she was sent to the most gosh-awful school where they were probably worse than her parents. Some readers have written reviews saying she was spoiled. Well, I don’t see it. Yes, she was provided with clothes (which she hated), jewels (which she hated) and all the luxuries. The clothes and jewels weren’t of a style she would have preferred and she was denied any of the luxuries that were important to her. She was like a bird in a cage – lovely but denied all freedoms. Her parents were cold, boorish and very unloving – her only use to them was to provide them a social status when she married. All she wanted was to get away – to be alone – and she saw her chance when Hugo Penhallow called at her home. After Hugo meets Katherine again, he wonders where the lovely little Kate he knew had gone. She had been replaced by a shrew. When she proposes to him, they strike a bargain that can only bring unhappiness to both of them. However – she needs her freedom and he needs her money so they strike the bargain made in hell. Hugo doesn’t change throughout the book. He is always calm, caring, devoted to his family, happy, cheerful, etc. Katherine, however, is like a caterpillar coming out of its cocoon as a lovely butterfly. It takes her a while, it doesn’t happen overnight – and she has setbacks along the way, but, in the end, it is a lovely thing. It would have been nice to see a bit of temper from him on occasion - but then -- I guess that wouldn't have been what Katherine needed from him. This wasn’t an ‘exciting’ book that kept you turning the pages to see what would happen next. There were no real villains (other than her parents) who were trying to create havoc. It also had surprisingly little angst - given Katherine's history. It was a slow and steady read with a constant growth to our heroine. I particularly liked senor Rodrigo, the parrot. He was delightful and added a nice bit of humor. Another thing I liked was telling part of the story through the family letters. It was lovely to see the inner thoughts of the other family members – particularly the twin boys who were at school. This book is part of a series, but can easily be read and understood as a stand-alone. I loved the idea of a marriage contract slash childhood friends to more story. I was especially excited after seeing several high reviews already posted. Sadly this one was disappointing. I didn’t like Katherine. She’s a spoiled brat and definitely acts like one. I understand that her home life is arguably horrible, but I would have thought it made her nicer towards people, not so hateful. Hugo has potential, but he’s so laid back and it came across as not caring about anything. Even w 1.5 stars? I didn’t like Katherine. She’s a spoiled brat and definitely acts like one. I understand that her home life is arguably horrible, but I would have thought it made her nicer towards people, not so hateful. Hugo has potential, but he’s so laid back and it came across as not caring about anything. Even when he talks about the things he’s passionate about, those feelings didn’t come across. Plot wise, it felt like I was reading 5 different stories. Everything was disjointed and with so many characters and plot points and random POVs scattered about, the story didn’t flow. The chemistry was just okay, but I never saw the relationship go from friendship to love. Oh, and the random French words thrown about were quite annoying. Overall, it had a lot of potential. I liked the synopsis and how Katherine wanted control of her situation. For me, it was a bit of a struggle to read and I’m not sure why I didn’t DNF. I will not be reading any others of the series. 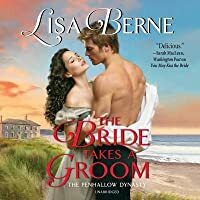 The Bride Takes a Groom by Lisa Berne is book three in The Penhallow Dynasty series. This is the story of Katherine Brooke and Captain Hugo Penhallow. I have read the previous book but feel you can make this a standalone book if you choose to do so. Katherine and Hugo once where childhood friends and Katherine loved his family, but then he went off to school and into service. In addition, her father inherited money from the death of her grandfather which set off a chain of events that changed he The Bride Takes a Groom by Lisa Berne is book three in The Penhallow Dynasty series. This is the story of Katherine Brooke and Captain Hugo Penhallow. I have read the previous book but feel you can make this a standalone book if you choose to do so. Katherine and Hugo once where childhood friends and Katherine loved his family, but then he went off to school and into service. In addition, her father inherited money from the death of her grandfather which set off a chain of events that changed her life. Her family moved into another house, became distance and crew in addition they sent her off to school where she was surrounded by more cruelness. Now they plan to marry her off to a tittle and her life still won't be hers. Hugo was injured during his time in service and now returning home he finds that the money he has been sending back wasn't enough and that his family is in need. Katherine and Hugo come to a understand that they will marry with both getting something out of it...for Katherine, her freedom and Hug will get her money to help his family. We watch as Katherine starts to become the person she should have been and not the person her cruel parents seem to turn her into. The first half of this book was excellent which is why I gave it three stars. It went off the rails for the second half, however, and made it a much more tedious read in the end. The plot in the blurb was resolved around the 40% mark. Part of what kept me reading up to that point was my curiosity as to whether Katherine became a better person or not. I was looking forward to watching Katherine and Hugo get to know each other again and fall in love. Somehow I felt robbed of that. Katherine is bey The first half of this book was excellent which is why I gave it three stars. It went off the rails for the second half, however, and made it a much more tedious read in the end. Katherine is beyond awful at the beginning. She’s a complete snob to everyone. But you know what? By the end I found myself liking her much more and realized she didn’t truly know who she was either. And I even kind of felt bad for judging her. Hugo was crazy laid back throughout the entire book and very few things rattled him. And that’s about all I really learned about him. That, and the fact he loves his family. A TON of stuff happened in this book. Unfortunately, this made it seem as if the author just threw a bunch of scenarios into a bowl and then randomly picked one as she went along. I praise her for trying a different formula than H and h meet, conflict happens, conflict resolves but I kind of prefer it. Especially when there are lots of small conflicts that only last a chapter or two before their resolution. If you love letters written between characters, this book is for you. I happen to love this but there were just too many letters. I got to the point that I was skipping them completely. Though this wasn’t really my cup of tea, I will still read Lisa Berne again. 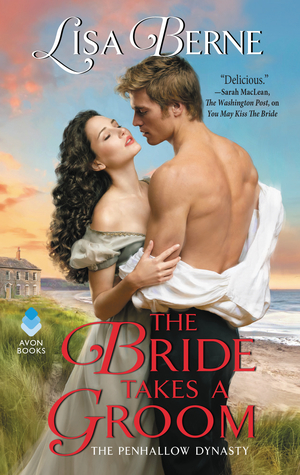 A spoiled heiress and a self-sacrificing hero were quite the fiery match in The Bride Takes a Groom, which was basically a friends to lovers *and* a marriage of convenience trope. After a very rocky beginning, this pair ended things on a wonderfully romantic note with a lovely HEA for all involved. The Bride Takes a Groom is the third book in the Penhallow Dynasty series, and my first read by this author. Penhallow is an esteemed and revered name in London society, and the family bucks tradition by marrying for love and maintaining close relationships throughout the family lines. I really liked everyone in the family, even Aunt Henrietta, who is a reformed stuffy matron sort. Captain Hugo Penhallow has been in America fighting a war for the past 10 years or so, and has returned home after being shot and breaking his leg. He rushes back home to see his mother and siblings, and finds all the love he missed while he was away. Unfortunately he also quickly realizes their dire financial situation, and he sets out to remedy their lack of resources right away. I liked that Hugo was an amiable and easy-going fellow - nothing ever seemed to ruffle his feathers. His dedication to his family and even his bratty bride was admirable. I would have liked to spend more time in Hugo's head, and wished that his character had been developed more once the story was established. Katherine Brooke is an obscenely wealthy heiress to a family with common origins. Her parents are crass and ostentatious, and they are very strict as they have hung their hat on trading Katherine for a title and elevated social standing. When childhood friend Hugo comes back into her life, Katherine views it as the perfect business transaction to get out from under her parents' thumb. Unfortunately, Katherine acts extremely cold and high brow, and I absolutely hated the way she treated Hugo and his family for over half the book. She was such a brat and unlikable in every way. I admit that she was mostly redeemed by the end of the book, but that didn't start until very late, nearly 80% if I remember correctly. The romance between these two was hot and cold, with more time on the cold and frustrating spectrum than I prefer. Hugo was definitely more committed and caring, and we didn't see the same side of Katherine until tragedy struck. Luckily, the Penhallows made up for Katherine's lack and really kept the plot advancing when I grew tired of Katherine's attitude. I particularly loved their penchant for collecting stray and homely animals, particularly Sir Rodrigo, the featherless parrot. He added a wonderfully light and humorous aspect to the story. I did enjoy Berne's writing style and all of the other characters besides Katherine, so I will definitely continue reading her in the future. First I must go read the back list from the Penhallow Dynasty as I am just dying to know how the previous couples met and fell in love. This is a hard book to review. Lisa Berne shows excellent writing skills, but somehow the story just didn't fully engage my emotions. The premise was good; a nice twist on the marriage of convenience trope. My biggest complaint was the minimal amount of Hugo's point of view. I really liked him at the beginning, but the book failed to show the development of his feelings toward the heroine. As a result, Hugo seemed vague and indecisive. I felt sympathy for Katherine, but she went a long time with This is a hard book to review. Lisa Berne shows excellent writing skills, but somehow the story just didn't fully engage my emotions. The premise was good; a nice twist on the marriage of convenience trope. My biggest complaint was the minimal amount of Hugo's point of view. I really liked him at the beginning, but the book failed to show the development of his feelings toward the heroine. As a result, Hugo seemed vague and indecisive. I felt sympathy for Katherine, but she went a long time with no real direction. That was a intentional part of the story, but it caused the book to not flow well. Their "I love you" reveal at the end of the book seemed anti-climatic. * A copy of this book was and provided by the publisher via NetGalley/Edelweiss for the purpose of an honest review. All conclusions are my own responsibility and I was not compensated for this review. What’s it About? Katherine Brooke has it all, looks, wealth, and youth but she is still just a pawn in her parents’ ruthless plans to marry her off to the nobility. Originally posted on Adria's Musings and Reviews (Blog post MAY have additional content such as playlists, interviews, giveaways, etc). What’s it About? Katherine Brooke has it all, looks, wealth, and youth but she is still just a pawn in her parents’ ruthless plans to marry her off to the nobility. Enter childhood friend Hugo Penhallow. He has a name that is highly respected but his family is facing financial ruin and Katherine sees her chance to be free of her parent’s control. She’ll marry Hugo for his name and in return he gets her money. It’s the perfect business arrangement. Or is it? Overall reaction to the book? The Bride Takes a Groom is one of those books where a reader will enjoy the plot for the most part but won’t particularly like the heroine and maybe even the hero. I fluctuated between “like” and ambivalence with the hero. I flat out disliked the heroine. Hugo isn’t a bad hero; he was just so easy going that he sometimes slipped into the spineless category. I don’t think I’ve ever come across a spineless hero before. I have to say, I don’t like it. He just didn’t say or do much when it came to Katherine’s behavior. I kept waiting for him to just give up on her and find a better woman to build a life with! Ugh, his taste in women had me questioning his intelligence and his self-confidence. His love and patience with his family was what balanced out his more negative traits, making him an okay character in my eyes. I never really felt he was someone that was made for the spotlight; he had more of a secondary character feel to me. But oh my word but Katherine was the real problem of the story. Super rich and super entitled she was just the worst. She may have had good intentions in some cases, like with her charitable causes but those were always overshadowed by her attitude towards Hugo and his family! Supposedly she and Hugo had been childhood friends but you wouldn’t know it by the way she behaved with him. Meanwhile he was all patience, warmth, and affection. I just couldn’t understand why this silly pea brained creature was someone who would even be considered a heroine when she was just so frustrating. I’d go as far as to say she was a giant PITA. I would have been happier had she dropped off the face of the earth, leaving Hugo to find someone more worthy of his kind nature. Needless to say that the romance suffered greatly because of Katherine’s idiocy. I never felt their romance really went anywhere beyond lukewarm and that was because of Hugo’s overtures. I couldn’t cheer for these two as a couple because I just couldn’t stand Katherine. Everything suffered because of her. The Bride Takes a Groom isn’t a terrible book though. I enjoyed Lisa Berne’s writing style but because of two lackluster characters, one being a brat in need of a good kick in the pants, I don’t think I got a really good idea of what this author is capable of. I did feel a little overwhelmed in the very beginning with all the chattering going on with the Penhallows. It felt like a character dump to me. I have to admit I really struggled with this book. I picked it up and put it down several times simply because the heroine really rubbed me the wrong way. Katherine has had a tough upbringing, there is no denying that. However, I have to say she is certainly lucky Hugo and his family are so kind hearted to give her a chance and believe there is something more beneath the surface. I'd have to say with a majority of other people she would have been dismissed as being a royal PITA because wow! Some of the things she says and does would have made me want to slap her. Yes, she has these random grand gestures of charity but still it took a good long while before I even found her tolerable. By the end she definitely made some strides towards likability but it was a little too late and she never endeared herself to me. Hugo on the other hand was so congenial and took everything in stride that he almost came across as spineless. I wanted to cheer whenever he ever showed a hint of being disgruntled with Katherine's attitude, words and actions because I felt there is a fine line between being easy going and being a door mat. 2.5 stars? i did like it....but it didnt? This is a book that will make you and cry. Two people, one broken in body the other broken in spirit. It starts out with action and ends with love and action. Well worth the read. This is my first time to read anything by Lisa Berne, I'll be looking forward to reading more of her work. Lisa Berne has a unique style that didn't grate like some stream of bizarre conscience books can. I liked the relationship. Hugo was a man's man but not arrogant or autocratic in any way which I enjoyed. His family is just darling all the way around. I enjoyed this one and while I want to read the next one I don't think I'll go back and read the first two. The story ends with plenty of good fortune and luck. I was also wondering what happened to her family in the end although it didn't seem relevant. Overall, those parts are not that realistic but I'm a sucker for a happy ending and I will never complain about a too happy ending. Bonus point for hero making sure about consent all the time. I like seeing that change in HR. No more of those "I know you want me and I will make you realize" heroes. Have to admit that I almost didn’t finish this book. Katherine was very unlikable in the beginning, so much so that I thought there’d be no redemption for her. Thankfully that wasn’t the case. Though I don’t think having readers hate the heroine first thing is a great idea. The book is enjoyable, however I could have done without the random French, as well as going to secondary characters’ pov. A really solid book, with a heroine who learns to love herself and becomes part of a family. Marriage of convenience between childhood friends, an heiress and a Captain. I'm finished... as in I gave it two chapters and gave up. Normally, I won't leave a review on a book I don't finish, or in this case can't finish. The writing, at least in the first two chapters, is nothing but tell tell tell tell, a dash of insipid dialog, and back to tell tell tell. Then there are the info dumps which aren't needed and don't advance the story. There's proper words and complete sentences and they fall flat. The characters aren't even two dimensional. Nothing about this engaged I'm finished... as in I gave it two chapters and gave up. Normally, I won't leave a review on a book I don't finish, or in this case can't finish. The writing, at least in the first two chapters, is nothing but tell tell tell tell, a dash of insipid dialog, and back to tell tell tell. Then there are the info dumps which aren't needed and don't advance the story. There's proper words and complete sentences and they fall flat. The characters aren't even two dimensional. Nothing about this engaged me enough to continue reading. I even tried skimming to no avail. Honestly just skimmed the last 75 pages or so, because I couldn't force myself to finish it. The heroine was so irritating and idiotic that I couldn't force my way through another page. I get that the author leaned heavily on colorful secondary characters to spice up the story but they just made it feel cluttered and chaotic. The protagonists had very little chemistry, and as previously noted I had zero respect for the heroine. Shame because the cover is really beautiful. It took at least half the book to fall into step with the MC Katherine. She is distant and withdrawn and in her own world away from the rest of the characters for most of the book, even her love interest. This can make it hard to like the main character and connect. It really hits it's stride at the halfway point and then you can really enjoy the book. So my advice: stick in there and read through. Fave new author for sure. This is such a deft romance, which is equal parts a character study and a romance. I love, love, love the romance in this: childhood friends, grown apart in a marriage of convenience. And it features my fave type of romantic hero - the sweet, charming, non-rake. And on top of that the heroine is amazingly characterized and gets one of the most interesting arcs in any romance I've read. Also some excellent love scenes, wooh! This is a typical romance that takes awhile to develop. They marry in name only to fulfill problems in their families. Katherine has the biggest change after marrying Hugo, she realizes she's always loved him. And god-like Hugo has to overcome physical problems to become all he can to find happiness in his marriage. He realizes he's loved Kate all along too. They make lemonade out of lemons. Gwendolyn/Gwenie 14 - imposive, wants to be pirate. Bertram - 12 scientist like father. Always reading natural history,science, mechanical books. The Penhallow series is something different. Storybook prose woven into real emotions. I read dozens of romance novels and blazed through the three available in this series in two days. Note to self: loved the way the heroine takes control to try and get what she wants, freedom from her family. Also loved the relationship between Hugh and his family. I write historical romance for Avon/HarperCollins. To learn more about me, my books, and my quirky interests (as revealed in my blog), you are cordially invited to visit my website, www.LisaBerne.com, and to sign up for my newsletter, too, so that you’ll never miss a new release!